Star Wars Tie Fighter ! WHEEL BIKE HAS VERY TINY CREASE TO RIGHT OF BUBBLE. IT IS VERY MINOR. THE REST ARE COLLECTOR GRADE. ALL PROBLEMS CAN BE FIXED. This is for one complete engine setup for y wing they are 3D printed may need to be sanded and painted to match perfectly. 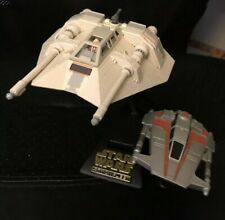 1996 Galoob Micro Machines STAR WARS ACTION FLEET Series Alpha Snowspeeder. Star Wars Shadows of the Empire New In Box 1996. A Collectible Star Wars Toy! Black Series condition should be stated above. ORDERS AFTER 72 HOURS AND NO COMMUNICATION WILL BE CANCELLED. UNPAID ITEM CASE WILL BE FILED IN CERTAIN CIRCUMSTANCES. Star Wars Black Series Titanium Series Vehicles. We know you will enjoy it too. Star Wars Legacy Collection Millennium Falcon 2008 Hasbro Working The playset is in excellent used working condition. From a smoke free home. It is not complete. Please look at pictures to see everything that you are getting. We do our Best describe every item accurately. If you have any problems please email us immediately and we Will get the issue resolved. We do combine shipping on multiple items purchased at the same time. Please add all items to your cart before checking out. EBay should automatically calculate the shipping cost. In the event that you were overcharged for shipping you will receive a refund within 24 hours. Every part is original including the decals. (Kenner 1980). All of the parts are original including decals. (Kenner 1984). STAR WARS: Imperial Shuttle. Wings: Main wing is at a slight angle (see photo). Both wings raise and lower. One wing hangs at an angle when in the upright position, the other wing holds in the vertical position. It is not screen accurate. It is printed in PLA at 0.15mm and 0.2mm layer height with 1.2mm thick walls at 5% infill, thus it is light weight and sturdy. Be careful with the bridge on the largest part, its the only weak join on the print. Deagostini Star Wars Spaceships/Vehicles Droid Starfighter. Plastic bag is open but the Starfighter is sealed. 2 Blue struts are included but 1 has a broken Piece and the other is a bit twisted. The Quad Guns have both the tabs. 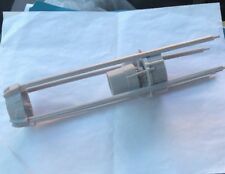 The radar assembly has been repaired because one of the legs was broken, cockpit w/ glass, are in very good, clean shape. HOWEVERDUE TO THE POSITION OF THE SLAVE ONE IN THE CASE, THE REMAINING SLAVE ONES WILL HAVE THE TYPICAL SMALL CREASE TO THE RIGHT OF THE BUBBLE. Your country is imposing a new low value 10% import fee. 2 1978 Star Wars X-Wing Fighters One is General Mills/ Kenner Products, the other is Lucas Films LTD. They are both missing the cockpit covers and the guns on the wings. STARWARS EPISODE ! TRADEFEDERATION DROID STARFIGHTER WITH OPENING WINGS 1998 HASBRO GALOOB TOYS INC MINT CONDITION 66520. Afterwards, I will be unable to adjust the price. I AM, HOWEVER, WILLING TO WORK WITH YOU ON THEM. ORDERS AFTER 72 HOURS AND NO COMMUNICATION WILL BE CANCELLED. UNPAID ITEM CASE WILL BE FILED IN CERTAIN CIRCUMSTANCES. Limited Edition Millennium Falcon by Franklin Mint. I believe it is made of pewter with 24kt gold plate. Commemorates the 20th anniversary of Star Wars. 7 inches in length. Very rare item. There seems to be a little separation between the two halves but they are tight. Please view photos carefully for other potential condition issues. Shipped with USPS Priority Mail. Black Series condition should be stated above. I TRY TO KEEP ITEM PRICED AS LOW AS I CAN IN ORDER TO STILL MAKE DOING THIS EVEN WORTH IT. ORDERSAFTER 72 HOURS AND NO COMMUNICATION WILL BE CANCELLED. Your Chance To Own An Original Piece Of Star Wars! Shows Signs Of Wear. Black Series condition should be stated above. I TRY TO KEEP ITEM PRICED AS LOW AS I CAN IN ORDER TO STILL MAKE DOING THIS EVEN WORTH IT. ORDERS AFTER 72 HOURS AND NO COMMUNICATION WILL BE CANCELLED. Black Series condition should be stated above. THIS FEATURE ONLY WORKS ON DESKTOP COMPUTER BUT WILL SAVE YOU MONEY. I TRY TO KEEP ITEM PRICED AS LOW AS I CAN IN ORDER TO STILL MAKE DOING THIS EVEN WORTH IT.